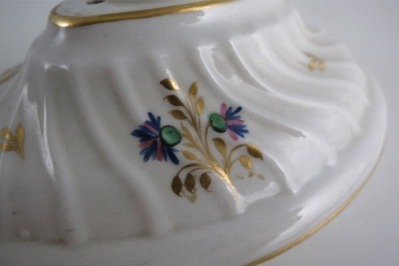 An elegant 'Flight and Barr' period Worcester Oval Shanked Teapot and Cover, Blue, Pink, Green and Gilt Flower Sprig Decoration, Underglaze Scratched 'B' mark, c1795. 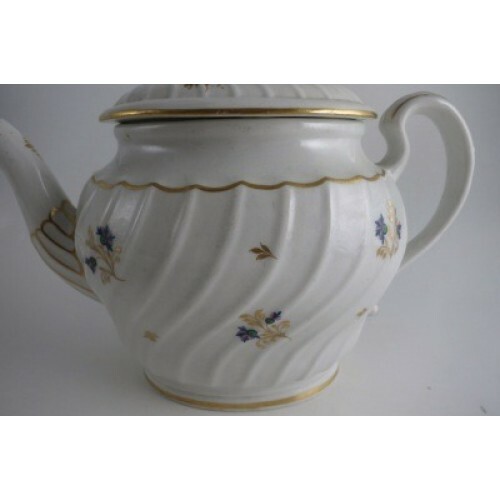 The Teapot has a beautifully shaped handle with moulded and gilded leaf capping, elegant half moulded spout and a shanked moulded cover with oval moulded and gilded finial. 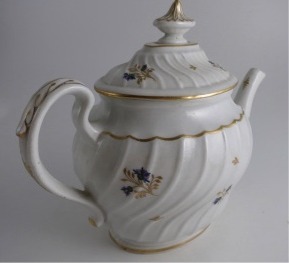 The body of the Teapot is of a waisted shanked moulded shape. 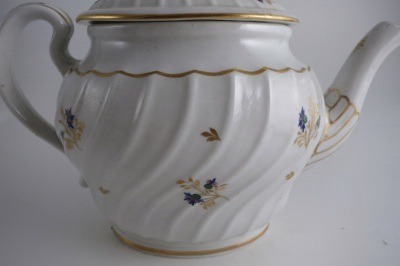 This shanked moulding going round the teapot's body up to its shoulder. 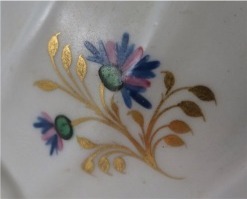 It is also repeated round the cover. 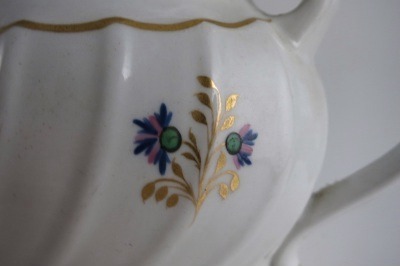 The body of the teapot is decorated with Blue, Pink, Green and Gilt Flower Sprigs as well as minor gilded leaf sprigs between them. 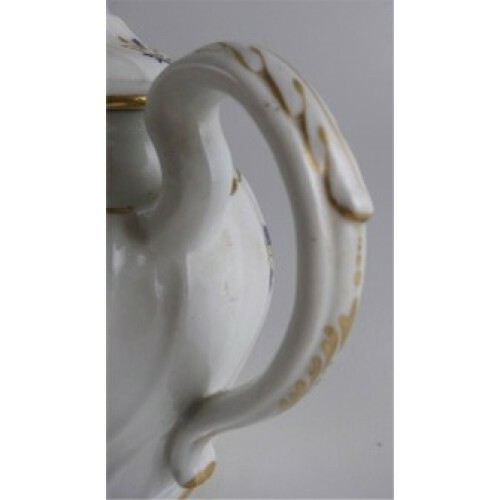 The Teapot has a very elegantly shaped handle with a 'kick back' scroll at the top. 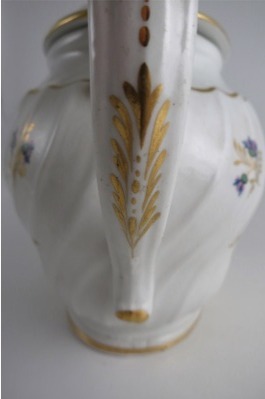 The top back edge of the handle is beautifully moulded with an acanthus leaf which is edged in gilding. 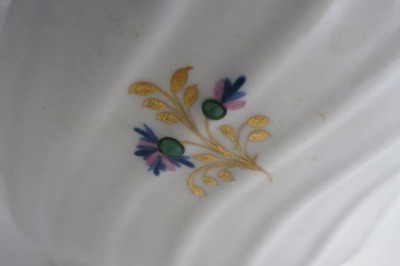 Below the moulded leaf is an applied gilded leaf decoration. 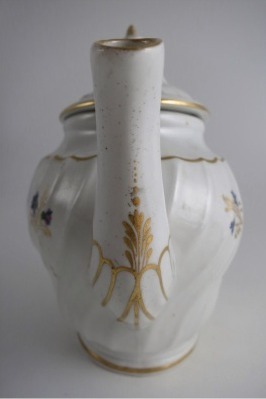 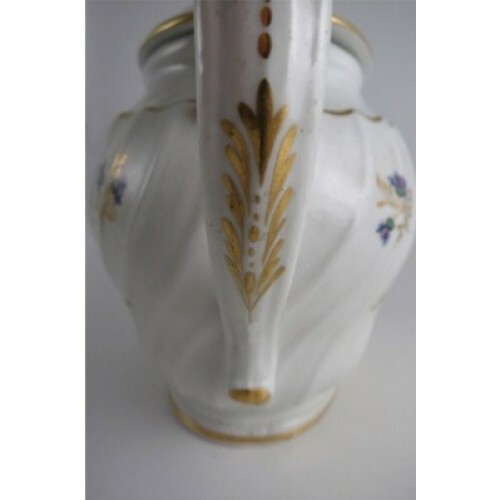 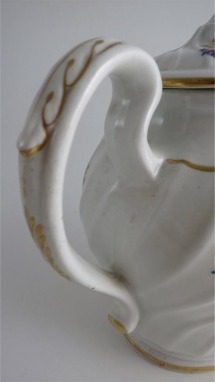 The 'S' shaped spout has a Reed moulded lower portion that is picked out with gilding. 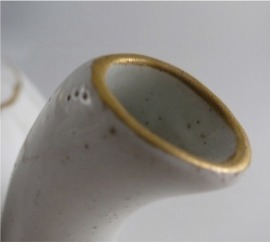 The very end of the spout is also gilded. 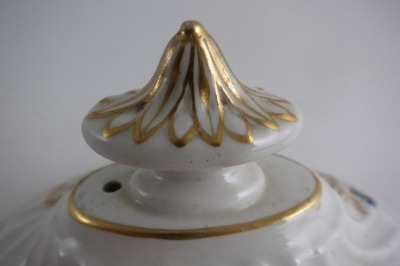 Further applied gilded foliage is on the front underside of the spout. 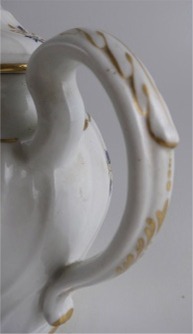 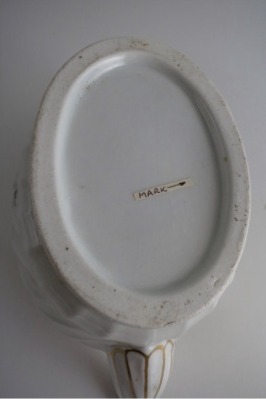 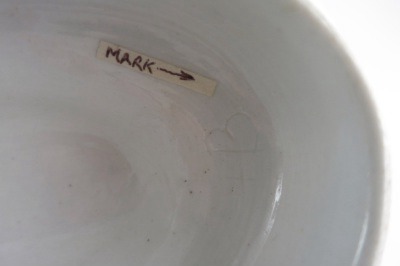 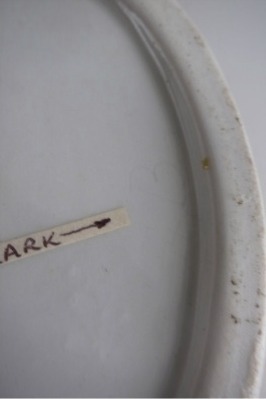 The Teapot is marked on the based with the scratch mark 'B' for 'Barr' of the 'Barr and Flight' Worcester period, c 1795. 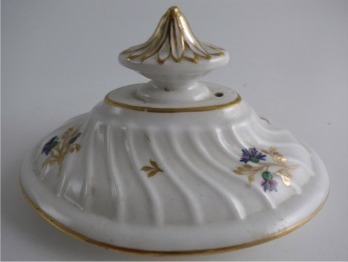 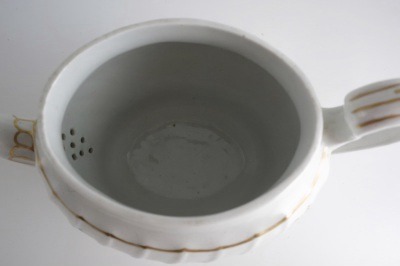 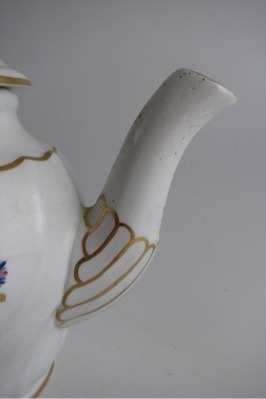 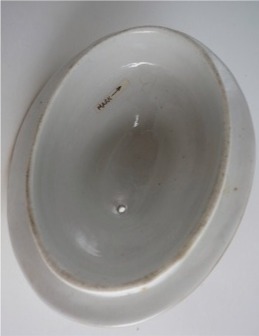 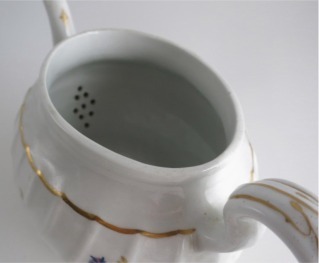 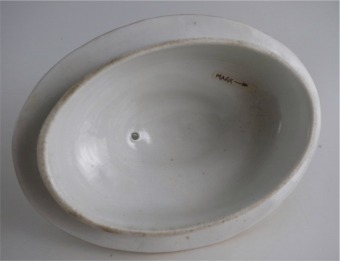 The oval cover of the Teapot has the same shanked moulding as the teapot itself. 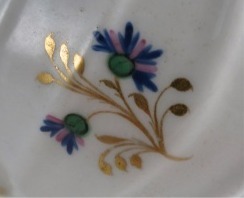 It has the same flower sprig decoration and applied gilding. 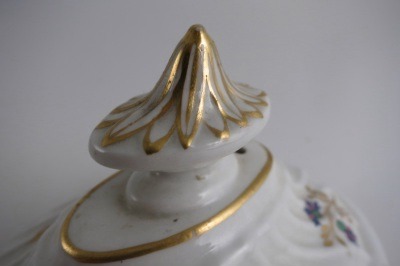 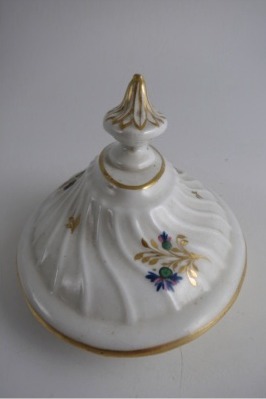 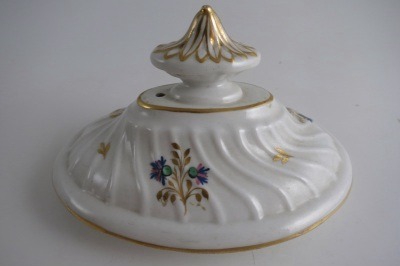 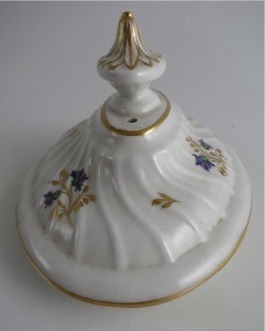 There is a very pretty oval finial with moulded foliate top picked out with gilding. 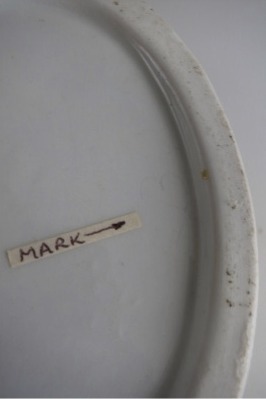 There is the same incised scratched 'B' mark on the underside of the cover. 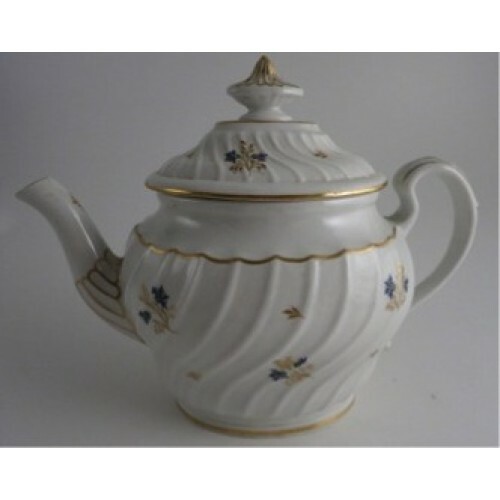 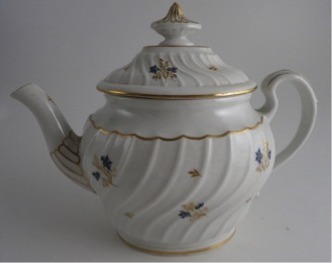 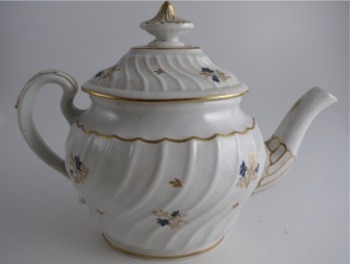 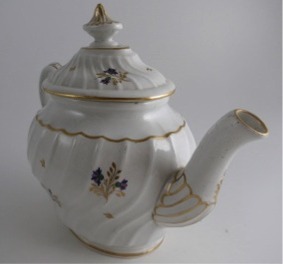 This beautiful 'Barr' Worcester Teapot and Cover is in excellent condition with no chips, cracks, repairs or restoration. 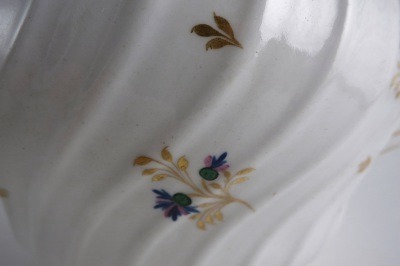 The decoration and gilding are in very good condition. 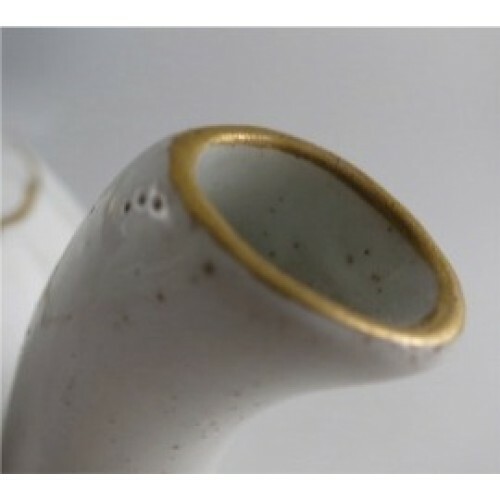 The only extremely minor manufacturing imperfection is some tiny pitting to the glaze around the end of the spout, this was caused during the firing process. 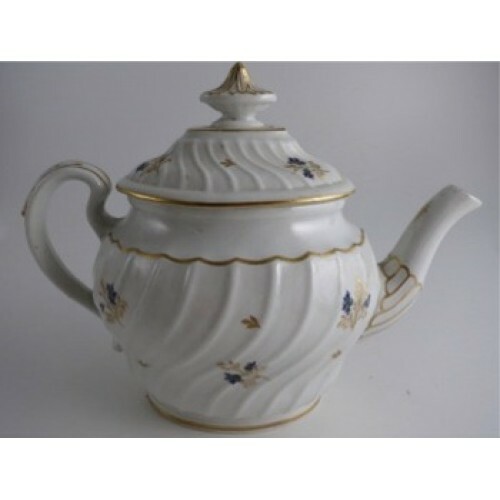 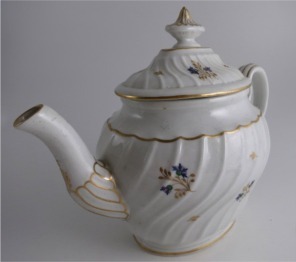 This is an excellent Teapot for the collector of Worcester or Eighteenth century tea wares. 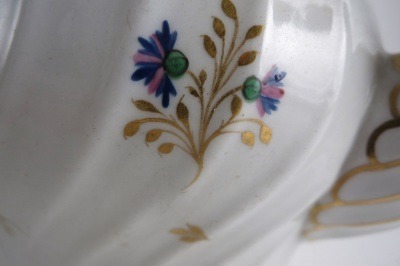 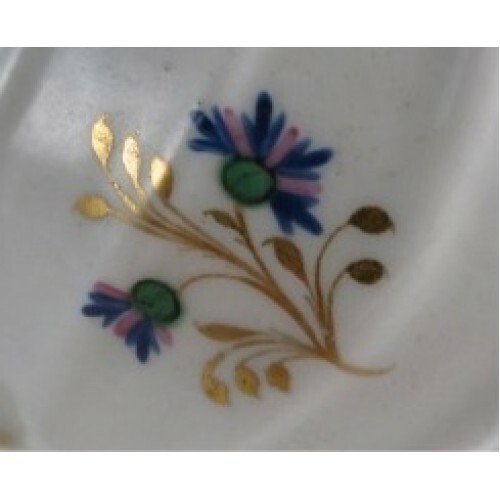 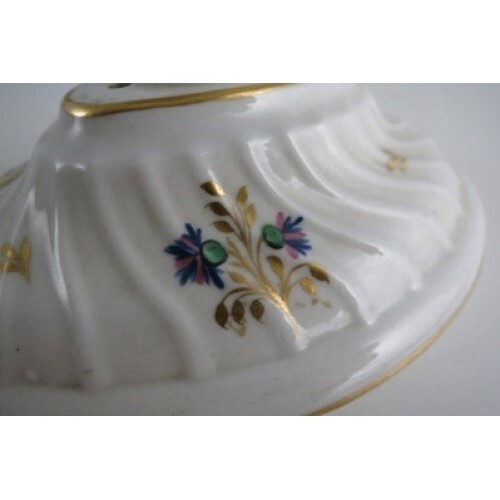 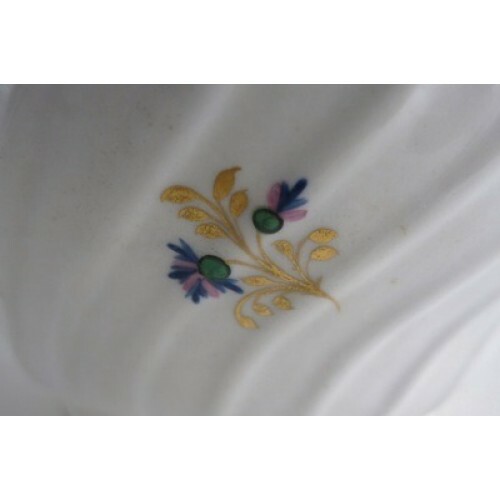 Description An elegant 'Flight and Barr' period Worcester Oval Shanked Teapot and Cover, Blue, Pink, Green and Gilt Flower Sprig Decoration, Underglaze Scratched 'B' mark, c1795. 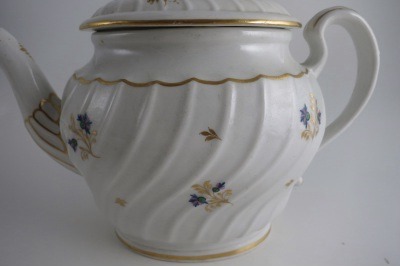 Condition (See main description for full details and pictures) This beautiful 'Barr' Worcester Teapot and Cover is in excellent condition with no chips, cracks, repairs or restoration. 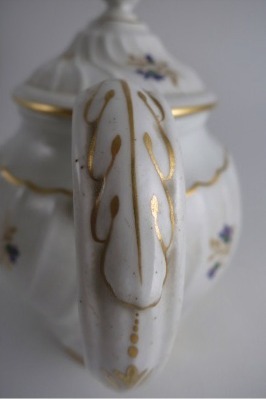 The decoration and gilding are in very good condition. 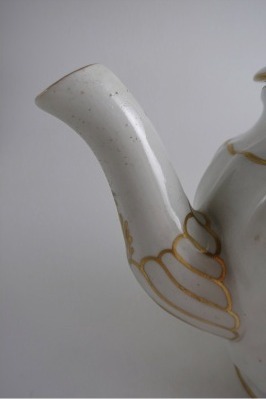 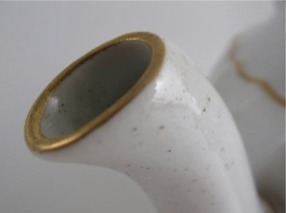 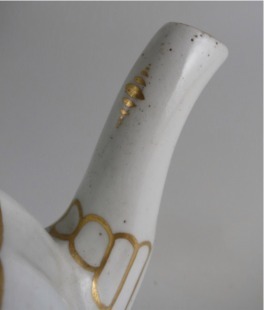 The only extremely minor manufacturing imperfection is some tiny pitting to the glaze around the end of the spout, this was caused during the firing process. 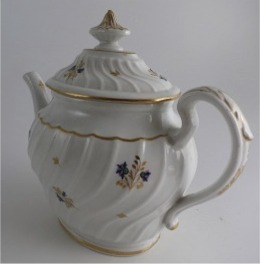 This is an excellent Teapot for the collector of Worcester or Eighteenth century tea wares.